With 20 grams of protein, less than 1 gram of sugar and only 130 calories, Fit Frappé™ will give you a healthy boost to power through your day. This great tasting, good for you drink comes in five fabulous flavors: Mocha, Espresso, Vanilla Latte and Coffee-Free Chocolate and Vanilla. 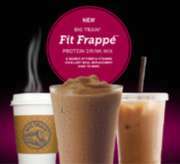 It can be conveniently prepared in three delicious ways: Hot, Iced or Blended.